Broadly speaking you can solve customer problems two ways. You can solve them directly with customer support or try and get to the root cause by building or improving a product. Jeff Vincent has done both since he joined Wistia as its sixth employee. Whether running customer support, or now as head of product, Jeff has been laser-focused on solving problems for customers of the business video platform. It’s left him uniquely positioned to comment on the relationship between product teams and customer support. Despite his transition to a product role in recent times he continues to be one of the regular contributors to the Support Ops podcast, a weekly show dedicated to the delivery of better support experience to customers. Jeff joined me on the show recently from Wistia’s Boston office for a wide ranging chat which covered everything from how to incorporate customer feedback into product roadmaps to the importance of being your authentic self in the workplace. If you like what you hear, check out more episodes of our podcast. You can also subscribe on iTunes or grab the RSS feed. If you want to successfully make the transition from support to a product role it helps to care deeply about customer experience. In support you get to help customers directly but very often the root of the problem you are trying to fix is in product. There are four key inputs into creating successful customers; trust, confidence, consistency and authenticity. The latter is particularly important for support, as authenticity helps you be really honest with the customer. You don’t want customers to become over reliant on customer support which is where product education and self-service resources come in. You should be attuned to any opportunities to automate support but also be intensely human when that’s called for. There are many inputs into a product roadmap, but the customers voice should inform all of those inputs. Wistia has several tactics to help ensure the customer voice is heard. The best product teams know what they stand for and what they are trying to solve. It’s essential to stay focused on those two factors. Jeff Gardner: Jeff, welcome to the show. To get started, can you tell us just a little bit about Wistia? What’s the company’s mission, and how has the company evolved over time? Jeff Vincent: Wistia is really interesting because we are very data-informed, but we’re also on this mission to make business more human. We saw that video was this really engaging and emotionally personal media. It’s important for businesses to create content that scales, but also an opportunity to put the faces that make up the brand on screen for customers, for prospects, and for internal communication. We’re a video platform for business that focuses on hardworking video. On the consumer side, platforms like YouTube are really good at viral video – how many views can I get? Hardworking videos are video that get fewer views, but was created for a purpose. They have a goal like conversion. Getting people to take some sort of action, either while they’re watching the video or after. They have some sort of trackable goal. In terms of the way we’ve evolved, we’ve always been focused on this more human aspect, using video to communicate in an authentic way. When I started at the company, there were six people, and now we’re pushing 70-80. We’re doing more initiatives within the company now, of course with more people, but really it’s the same core. We’re talking all the time about how businesses are using video and how we think they should be using video in the future. Jeff G: That idea of hardworking video is really important. The ability for content creators to link their videos through and really have a lot of data behind what they’re doing, that’s pretty unique for businesses. I don’t think they’ve had a lot of that in the past. Jeff V: The idea is to take control of your content, so we do have some customers that use YouTube, but maybe they push them to a page on their website that, as an example, has some more premium content. Then they’re diving into the analytics that we provide to understand where people are tuning in, where they are dropping out, what kind of tools they could overlay within the video content to get more signups, etc. Jeff G: You’ve been in your current role at Wistia for about a year and a half now, but for a long time you held a very different position, Director of Customer Happiness. What was the driving force for moving from a customer support leadership role into product leadership? Jeff V: I’ve been at Wistia for almost six years. When I first came in, we had a couple of customers and the challenge was, how do we support them? What the heck should we be doing? Their emails are going directly to the CEO, and we don’t know what to do. My time in that support leadership role was about growing a team and setting up processes so we could take care of our customers the way that we thought that we should. We grew that team from, well, zero people when I started, to up to 12 people when I ended up changing roles. That team was going to continue to scale, so we needed a really good people-focused manager. That was Aaron Wheeler. He came from Moz, replaced me in that role, and has just been incredible. It happened to be perfect timing. We didn’t have a product team. Brendan Schwartz, who was a co-founder and CTO had been building the original product, and he had a few engineers, plus our head of product design, Jo. They were working through priorities, roadmaps, etc. But they saw opportunities to take on bigger challenges, to strike a better balance between working on customer-facing issues and features, and also the backend work. Striking a balance between the two of those and really growing the team – adding user research, design, product management – they asked me if I would take on that role and figure out how we could grow the team. That was really exciting. Those two things just happened to me overnight, and it’s been a really fun challenge. Jeff G: You’re not the first person I’ve met who’s made this pretty similar career transition from a customer-facing role into a more product-focused one. Do you think this might be a more common career trajectory for the future? Jeff V: When people ask me about whether they should be looking to make that transition, I definitely recommend it. For me, I care really deeply about the customer experience. I care more about the customer experience than pretty much anything else. 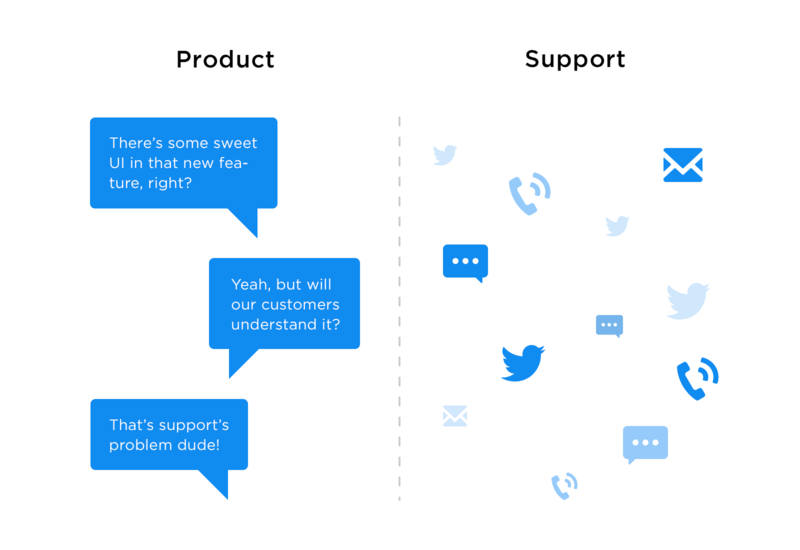 In a support role, you’re interfacing directly with the customer, but very often the root of the problem is in product. Following those problems upstream, I was always very involved, especially when we had a really small team and no product team. I was very involved in product and how we updated the product to support that better customer experience. The transition meant I had a bigger impact on a larger percentage of the customer base. Jeff G: It’s the gratification. Jeff V: That’s the balance that people need to figure out. Jeff G: There’s a lot of early stage companies that listen to this podcast and I’m sure a lot of them are trying to grow a support team from zero to X. How did you decide how to structure the team? What were the kind of things that influenced that decision? Jeff V: Yeah. This is such a good one. Such a tricky one too. We can talk contact info later, but I definitely would encourage people to reach out because so much of this can be conditional. When I left the support team, we had two separate teams between four and six on each, and we had team leads for both. We had people who would come up through support and who clearly had people management skills. They were better managers than I was. They probably just didn’t have that experience and that cross-company vision, and so their first step was being elevated to team leads and taking on the hard work of keeping people really engaged. We wanted to do a better job of having consistent conversations with each of our teammates. That’s when you identify the issues that otherwise could lead to burnout. At that time, customer happiness was really support and education. One part was answering tickets in the inbox and the other was thinking about more proactive or scalable education in the form of documentation or in-app messaging. Nowadays customer happiness is support, it’s customer success, it’s education and then it’s some of the transactional stuff like, how you do billing. The volume, at the time when I left, was about 200 to 300 conversations per day. I think we’ve just about doubled since then. Jeff G: Wow, not an insignificant amount of incoming requests then. I’ve heard you say previously that there are four key points that really help create successful customers. Trust, confidence, consistency and authenticity. I’m particularly curious about that last one. I’ve heard you previously describe authenticity as being more human as a business, and that it’s a key component of the mission at Wistia. How did you come to that as an essential ingredient of your customer and/or product strategy? Jeff V: The overarching belief for us there is that when people come to work, they should be able to be their true selves, and that if we were able to hire people and build a culture that consistently valued people being their real, weird selves, we were going to get far more out of each employee – and they were going to be far happier in the work that they were doing. That’s all about authenticity. Authenticity works perfectly with support because you want to be really honest with the customer. What you need to figure out is what information you should be sharing and what information you shouldn’t, and so we try to have conversations all the time about that. In terms of creating an experience, we’re not perfect and no software platform that serves a large number of customers is perfect. Whether it’s a bug or say we pass along some information that ends up being wrong, we end up getting a pass because we’re able to follow up and be human, so the customer doesn’t think about us as a corporation. You get mad at Microsoft. You get mad at Uber. You get mad at these faceless organizations. When the customer knows you as a person, when they can say honestly, “I know that Jeff and Brendan and Chris and Chris and all those people over at Wistia are working hard on this problem,” they tend to relate to it a little bit differently. They see their own imperfections as well. That piece is incredibly important. It’s why in our history we’ve never lost a support person because of burnout. We’ve lost them because they graduated on to a better role. Jeff G: In terms of really being about the individuals involved, do you think it’s impossible to keep that authenticity as you become a very large company? Jeff V: No, I don’t. That’s what video is really great for. Our team continues to put themselves out there. We send videos directly to the customer from the rep that they’re working with, or we send videos out around things like, “Hey, we’re taking a break for the holiday, but we love serving you.” We do that for weekends as well so when people reach out and we don’t provide support, we’ll follow up with an email that shows off some of those support faces. It has to pervade the entire company so you’re authentic within, but it’s also about the way you communicate with the customer. Our web page still has a single person’s face on it. It happens to be mine. They should A/B test that because I bet you mine is bad for business. We continue to put a face out there, and that sets up that relationship for success. Jeff G: Contradict me if I’m incorrect here, but I heard you speak at a conference a few years ago, and one of the points you made was that you actively work to keep customers from becoming dependent on the support team. This probably speaks to that education stuff we were talking about before. You guys make it just a little bit harder for people to get in touch. Your contact link is put into the knowledge base or help documentation on your site. What’s the thinking there? Are you betting that educating customers is a better way to make sure that they’re not dependent on you? Jeff V: I don’t think you’re wrong at all. The only detail there that I want to make sure we get right is that customers can contact us within their accounts and we try to make that obvious, although we haven’t gone so far as to use a widget the way that Intercom does, that prompts the conversation. I still very much believe that for support you should be trying to automate where you can and then be really intensely human where you can. If you think about it from the customer’s perspective, we’re seeing this trend that customers want a resolution to the problem – they don’t necessarily want to talk to somebody in all cases. What’s most important is that the problem gets fixed. When we were having a lot of our support be extremely technical, or something that was really hard to keep up with in chat, where it takes time to figure out what to do, that was really hard. That would be hard with a high volume. For us, we thought about how to get people the answers they needed faster without necessarily having to bury it in a queue of emails that we then have to work through. That led us to invest very heavily in our documentation, in our education resources. We want to put those out there. It’s not necessarily as a barrier. It’s because we think they’re really great and we want people to make use of those. I certainly agree with what you said around training the customer to solve their own problem because we don’t provide 24/7 support right now. A lot of small business owners that I’ve spoken with, marketing managers, they’re doing this in their extra time. You’re busy 9 to 5. You go home and you put kids to bed or whatever, and then maybe you go back and you do a few more hours of work. One of those things they may be trying to do, and I’m stealing this entire concept from a talk by Jeff Lawson from Twilio, is just solve their problem when it’s 9:30 and there’s nobody in the office. It all means investing heavily in your education resources and really putting pressure on the product to work right, not just to rely on the person. Jeff G: That’s actually a great segway into my next question. Paul Adams, our VP of Product, has written a lot about what goes into our product roadmaps at Intercom. There’s five inputs in our case, including obvious things like new ideas or features to help scale, but a crucial one, and I think probably this holds true for both us and you at Wistia, is that the voice of the customer gets a really important input. How do you decide what goes into your product roadmap and how do you take that customer information and help it inform what you’re going to build at Wistia? Very often it’s, “Here are some things that we feel, because of our gut and for how long we’ve been working on this, are really important. By the way, here are a few points about customers that may line up with this, or may not line up with this at all, that we just need to be aware of.” What it’s really about is how you pick those channels where the voice of the customer comes in. We’re piloting a voice of the customer program. Our customer champ, Bobby, is trying to dive deep into something we want to be working on from the product perspective in the near future, talking to maybe 20 customers to figure out how they use it, what some of the problems are that they’re running into, what are some of the things that on the horizon for them, so we can add all that up. That has been really, really wonderful for some of the small, iterative improvements like error message copy or a flow that’s not setup right. It’s amazing to hear feedback from a single customer and have other ones chime in and say, “Yeah, that was always confusing to me. I guess I forgot because I got used to how it is.” That’s been really a great channel for us. We also have our Beta Pug group. Beta Pug is Basic Experience Testing And Product User Group. The naming was a collaboration between Jo of product design, and Molly, who is now a product manager, but she came on for product research. She had very strong vision for what a beta team, a group of customers, could do for us and how we could move faster by getting their input. She’s built a group of probably 300 customers that say anything from, “Here’s a mock-up” to, “Hey, we’re thinking about working on this. What are some of your feelings?” She gets very fast feedback through that and all the product teams make use of that. A customer happens to be in town and wants to come by, and we’ll hit them up with all kinds of questions. Or we’ll go and see them in their habitat and find out what’s going on with them. We find ourselves going back to that all the time when we go to build a new feature. It’s about how you incorporate the voice of the customer. Certainly it’s not the customer driving the roadmap, but there are customer points and input that inform every single piece of the roadmap, from those new ideas to new features to quality improvements. That’s all driven very much by our gut, but also with and aided by customer feedback. Jeff G: In terms of taking all that feedback in and getting all this feedback from all these different channels, how do you parse through the vast majority of it that you know is never going to be built? How do you do that in a way that’s human and authentic, and make sure that you avoid bloat in what you’re shipping? I mentioned the product feedback Slack channel that we have. That can be great because people will reach out and we actually see our existing customers following up with someone who suggested something to say, “Hey, that doesn’t feel super Wistia. Maybe you should try this other thing.” That supports the point that what we’ve done a great job of is staying true to what we say our product mission is, the things that we try to help with, the things that we don’t try to help the customer with. That’s really important. Solving the problem and then saying a little bit about what that could look like, or what that doesn’t look like. Jeff G: Hunter Walk, who led product management at YouTube, was on the show recently and made the point that being consensus driven is death from a product management perspectives. What you’re talking about there sounds exactly like that. You take a lot of input, but then it really has to come down to one person who has the authority to make a call. Jeff V: I loved when he said that. Ken Norton of Google Ventures said that if you don’t say no, it’s death to the product, or something to that effect. What I took away was, “Say no a lot.” You pair those two together and you’re exactly right. You can’t let those external inputs run the show. Our biggest fear is being obviated. Building these features and iterating on making incremental changes, iterating our existing features or taking one more step with our current feature set, and being obviated by someone who came with fresh eyes and said, “Well, this is the problem that the customer is trying to solve. 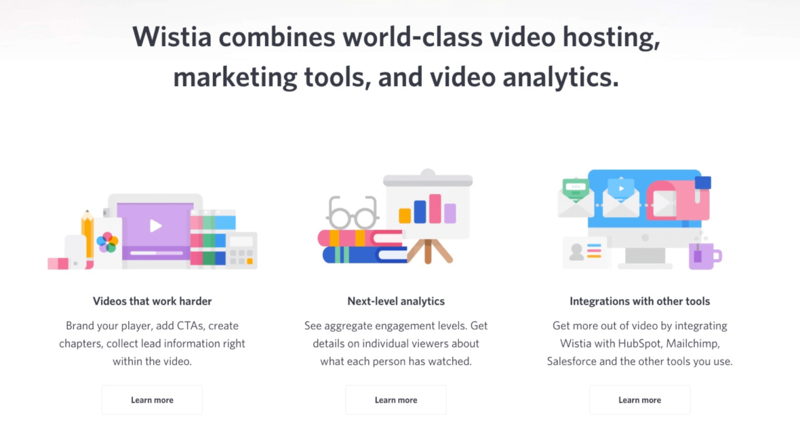 We can take these 12 steps down to two.” Suddenly Wistia has built all of this stuff up and it doesn’t end up being that useful. The customer says, “Thanks for fixing that bug or adding this little feature that I asked for, but I’m actually going to go over here because that team had built this whole product that actually solves my problem much better.” That’s a little bit of what Hunter and Ken are saying, that you need a little bit of that buffer between you and the feedback that you’re getting to say, “What is true north for you? Where are we going to be?” And being true to what your customers broadly really need, what they hired you for. That’s how you hopefully stay aware of, how do we obviate ourselves? How do we completely change the paradigm and not just iterate on what we currently have? That sets us up. We’re no longer a startup, but we’re still a pretty small company that solves an important problem for a lot of customers and that’s why that’s been successful for us. Jeff G: You covered a really important point there, that some of the best businesses in the world do a really great job at deprecating themselves constantly and moving on to new iterations or new versions of themselves. As a leader of product at Wistia, how do you help get this across to your PMs as well? How do you encourage that? How do you get them to take that step back and try to think completely out of the box and from a first-principles approach? Jeff V: I don’t exactly know how to get people to think like that. I don’t know if there’s a tried and true approach, but the conversations that we have internally are good models for that. Brendan, who is my manager and my mentor in all this product stuff, he is very good at thinking that way. That’s been infused in the way I think now, where I have this little voice in the back of my head that’s his, somewhere, saying, “There is a better way to do this.” It’s not just take what you currently have and turn the crank. We’re lucky we work in software. You could do just about anything if you figure out the right way to do it. They’ll come in, all of our team comes in, really, with these ideas like, “Hey, we could make adding a video to the web page much easier by starting on the web page.” That’s where the customer wants to work. Intercom is really based on this too. We can make communicating with the customer much easier if we start in the tool instead of being in the inbox, because what a weird switch that you have to make, what a bummer. Jeff G: Jeff, it’s been really great talking to you today. Is there any way our listeners should reach out to you if they want to get in touch? Jeff V: People can get in touch with me on Twitter. I’m @jeffvincent. I hang out there a good amount. Then I’d love to plug a podcast that for some reason they still have me on. It’s the Support Ops podcast hosted by Chase Clemons of Basecamp. We talk support and customer experience with Carolyn from Buffer, myself from Wistia and Chase Livingston from Automattic and WordPress. That’s the panel every week. I would love for people to come and check that out and give us feedback.